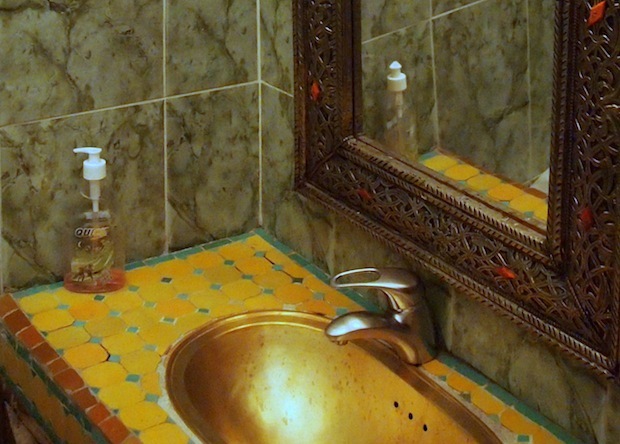 Spending time in Morocco is a study in contrasts, a confluence of old and new lives jumbled together, straining to move toward modernity while sustaining ancient traditions. The streets of villages around the Sahara, full of colourful jalabas and babies swaddled to the backs of their mothers as they go about their days, seems a world away from the luxury apartments of the bigger cities. 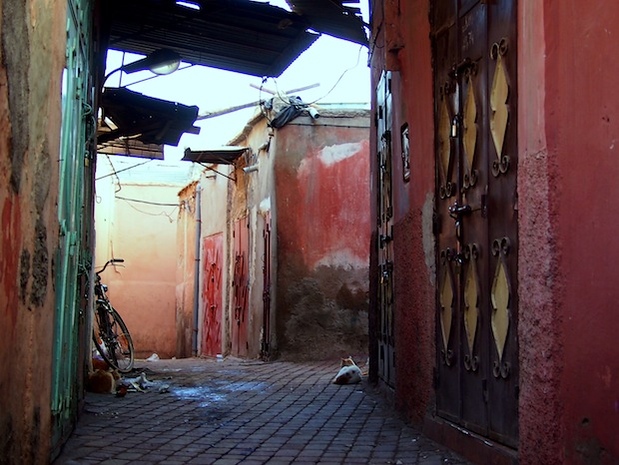 And there’s no better place to see the confluence of those many worlds than in Marrakech. Like many big cities, arrival can be overwhelming – which is where this crash course comes in. 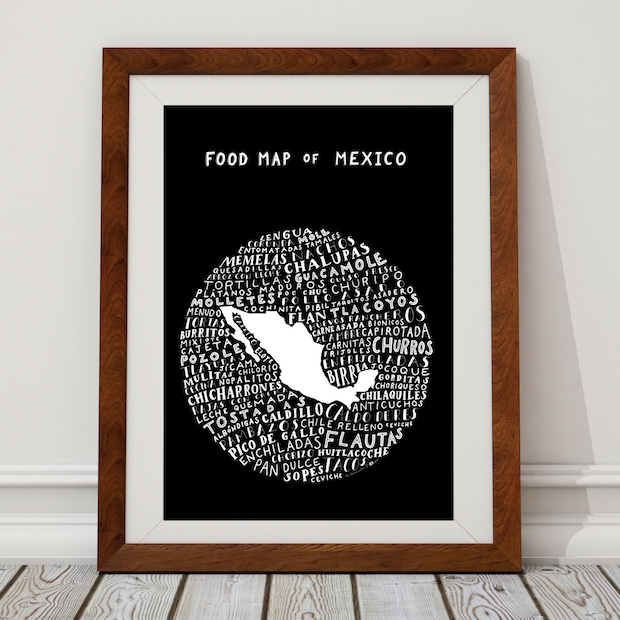 While I love the narrative and photoessays (they are a pleasure to write and share) I also want to be a help for the people looking to travel to the places I love. To wit: where to stay, what to do and where to eat – hopefully they will help demystify the capital and leave more room for soaking it all in. The quintessential question depending on who you are and how you travel. 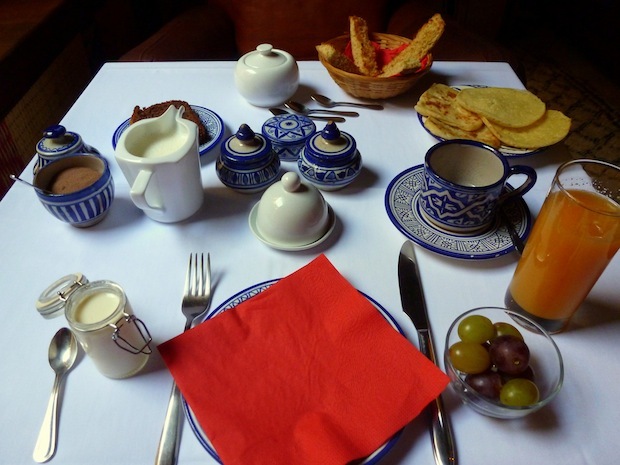 I stayed at several places during my time in Marrakech, from apartments to hotels to hostels, and wanted to give an overview for those looking to spend time in the city. You’re on a budget and you want to stay in the Medina. Riad Massin, all the way. I recommended this place to a bunch of different travelers, from Allen who wrote about the Himalayas here, to readers who wanted a budget stop in the heart of Marrakech. My G Adventures roommate Danielle provided the photos below (thanks lady!) but I can attest firsthand that it’s a wonderful place to park yourself for a few days. 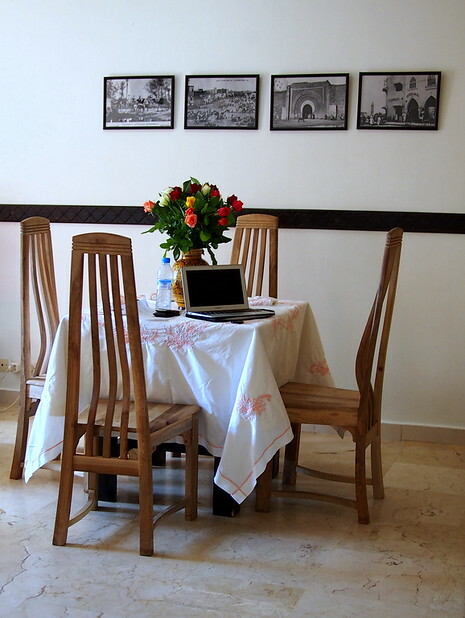 You’ll meet fellow travelers, get a riad experience and be a short walk from the famous Djemaa el-Fna. Finding the place from the start may be your biggest deterrent to staying there, but it’s worth the runaround. If you want a hotel in the new (European) part of the city: Hotel Oudaya has two connected buildings, free WiFi, a big breakfast and a pool to call your own, this hotel was the last stop on the G Adventures trip I took but I’ve recommended it to several readers already, as it’s centrally located with a considerate and generous staff and lovely rooms. For $80 a night, you can get a cheaper place within the medina but if you want to be away from the bustle (and near a big supermarket and cheap restaurants), this is a good place to pick. It’s also within walking distance to the train station, which makes it quite convenient for the next hop through the country. Address: 147 Rue Mohamed El Baqal, Marrakech, Morocco.☎ (+212) 4444 8512. If you want to rent an apartment in town: I wanted to stay in the city for a few days after the G Adventures trip was over to process my photos before heading to the desert, and renting an apartment seemed like the best way to do so. I looked into AirBnB but my friend Kim suggested Home Away, who offered me a media rate for renting in Gueliz for 5 nights. As I’m ridiculously picky about who I work with, I assure you I wouldn’t be mentioning them here were it not a product I really enjoyed. As home offices go, however? I had no complaints at all. The apartment was a 40-minute walk to the main square, but a quick stroll to the train station and supermarket. I reviewed the apartment glowingly on Home Away’s site despite the fact that I wasn’t requested to do so – it ended up being a perfect place to stay. The owners (unaware they would be written up here) would ring daily to make sure I was enjoying my stay. Upon my departure, they invited me to stay with them in France if I returned for a visit. The apartment rate included daily cleaning, a SIM card and phone, WiFi and a manager named Aziz who ended up arranging for a car rental and transfer to the train station after the contract was over. While not the most budget of all options for solo travelers, it was lovely to have a full kitchen and place to call my own or a week. It was the first time I’d thought about shorter-term apartment rentals, but it won’t be the last. 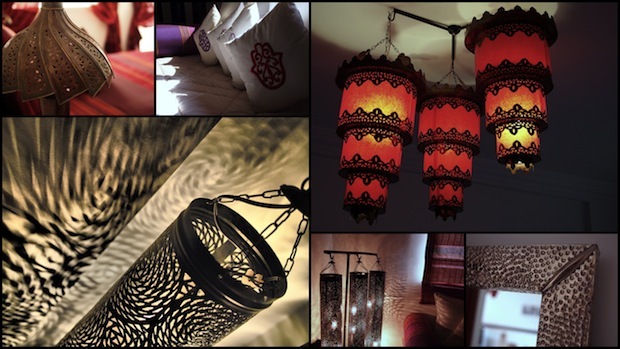 And the Moroccan-style decorations made it a cosy and comfortable place to come home to after the chaos of the city during the day. Saadian Tombs: Dating from the 16th century, these tombs were sealed by Moulay Ismail in the 17th century when he decided to built Meknes as the next imperial city. Left to memory during the length of his reign, they were only rediscovered during an aerial survey conducted by France in the early 20th century. With separate tombs for men, women and children, each surrounded by cascading patterns of colourful tiles and ornately carved wooden arches, it’s a beautiful place to spend part of your day. Address: Probably best to head over to Google Maps for proper directions to the tombs. El Badi Palace: Also dating from the Saadian times, this palace was replete with treasures and reflected in prose as one of the most beautiful palaces in the world. With the main riches removed by Moulay Ismail in his shift to Meknes, the palace is only an echo of its former glory. However, the architecture and sheer size of the palace make for a good use of your time in Marrakech. Address: Google Maps has the exact location here. Ben Youssef Madrasa: Built by the Merenids in the 14th century, the Medrasa remains one of the oldest places to study in the country. With dizzyingly complex carvings of wood and marble and geometric tiling on the walls, floors and ceilings, it’s well worth a wander. Address: Google Maps has the exact location here. The Medina: Get lost in the medina itself, the sprawling old city that will ensure that even the most seasoned of travelers will get lost. With dead ends, narrow alleys and doorways and a knack for putting you right back where you started (and not where you wanted to be), you’ll need to allocate quite a few hours to this endeavour – and a lot of patience. 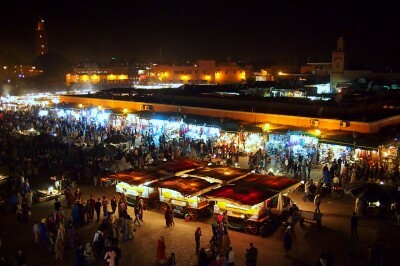 Djemaa el-Fna: A centerpoint for exploring the medina and surrounding souks, the Fna becomes the epicenter for movement and fun in the evening. wrote a whole post about the wonder and awe at sitting and staring at the maelstrom of movement as dusk approached. It’s not to be missed. 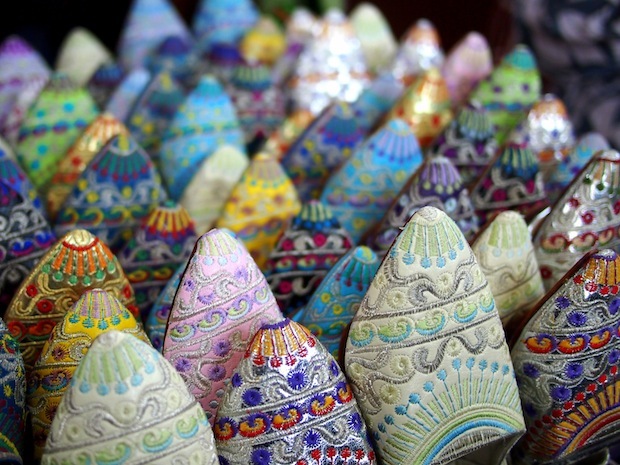 Souks: From the Djemaa el Fna, the souks spread outwards in spokes, sections at the front devoted to the main tourist wares and in the maze of back alleys, specific sections for each craft. Metalworks, wood carving, tanneries, shoe cobblers – each with its own set of streets and craftsmen. Bargaining is the name of the game, with the aim being to feign the most successfully authentic indifference, as though the piece you want is something you really, truly couldn’t care less about. 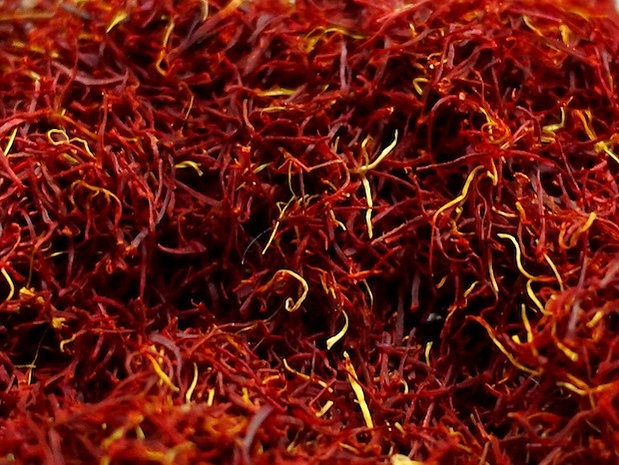 Saffron from Morocco, up close and personal. Sandwich Toubkal: Beyond the fact that I went back here so many times the staff started giving me free food, I found this tiny snack shoppe a comforting, down to earth presence in glitzy Gueliz. 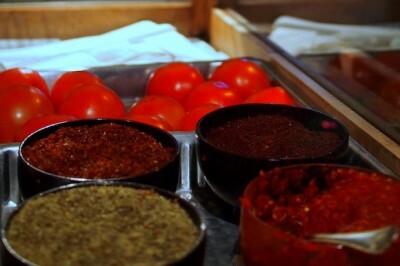 Manned by two waiters, one old and one young, the food is the basic Moroccan fare: tagines, couscous Fridays, sandwiches with fries and harira soups. But what sets this restaurant apart is the wide smiles you get when you walk in and the fact that you always know you’ll have a reasonably priced meal in the middle of the European part of the city. Address: Zerktouni, near the corner of Rue Mohamed El Baqqal, Gueliz. Across the street from Hotel Tachfine. Stall 32 and Stall 14 (of the juice stalls) at the Djemaa el-Fna: There are a dizzying amount of stalls to choose from, and they will all be calling you over, trying to take you by the arm, even. Cajoling, and smiling, eventually turning sour when it becomes clear you’re not going eat their meals. Why? Becauase you’re going to make a beeline for Stall 32 and get perfectly grilled lamb sausage and harira soup, stuffed like a sardine around a rickety, u-shaped picnic bench. Seriously. Do not pass go. Do not collect $200. Get straight to Stall 32. 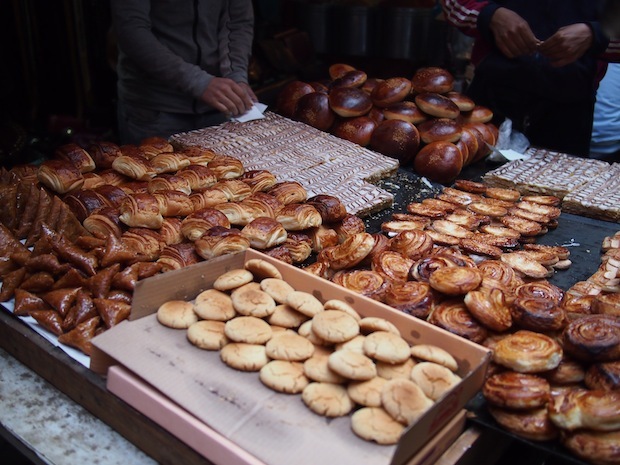 Snacks inside the Medina: An ideal way to eat your way through Marrakech is to literally eat as you walk, picking up some of the many sweets on offer as you wind through the old city. Macaroons, pastries and pistachio treats abound, cheap and delicious. You’ll find it hard to resist. This is but a small insight into the wonderful month I had in Morocco, and hopefully a useful guide to Marrakech. 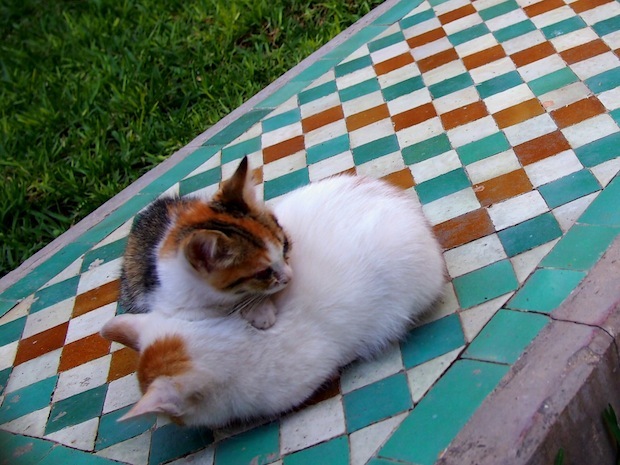 Together with the incredibly insane driving, copious eating of tagines and spending time with cats (there are a lot of cats in Morocco my friends. A lot of cats….) I hope it paints a picture of excited exploration, which is exactly what I felt waking up every day to see what it had to offer. Sounds kind of intense, but with ways to escape the intensity when you need a break. I know it’s obvious for historical reasons, but your photos show that the Reconquista in Spain left intact the finer aspects of Islamic life in Spain. Your photos are lovely! Thank you so much for all the great information. I totally agree for the Orange juice stalls, i was there last July, and my kids loved the fresh squeezed orange juice( i believe the name of the guy was Youssef)he was quite friendly…he got me by giving free juice to one of my kids!! lol, so i felt i had to buy from him. And i am glad i did. 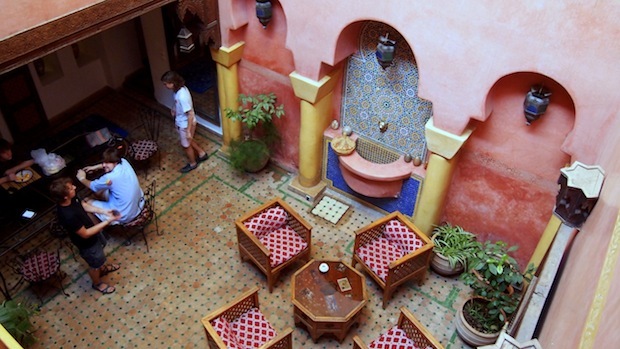 Anyway great post about Marrakesh, it is really a fascinating city…and has some wonderful medina Riads if you are looking for cheap hotel rates… or maybe you could head to the Gueliz cartier if want the jetset party style kind of crowd. Having read of your experiences has made me even more certain that I shall now book my visit to the place that I have always wanted to visit. Thanks for all the wonderful information & fab. photos.etc. My pleasure. Glad the post was useful and hoping you enjoy your trip to Morocco, whenever you do get there. It’s a wonderful place! Hello! My friend and I are touring Morocco and are in Marrakech for our last few days before heading back home. We are in ,ove with the Moroccan Macaroons and are looking for a recipe on them. I see you’ve posted a fantastic picture of them, do you know what the name of them is exactly? I can’t seem to find them when I generically search for Moroccan Macaroon. Hope to hear from you soon…until them I’m sure I will be having a few more. Hi Amy! 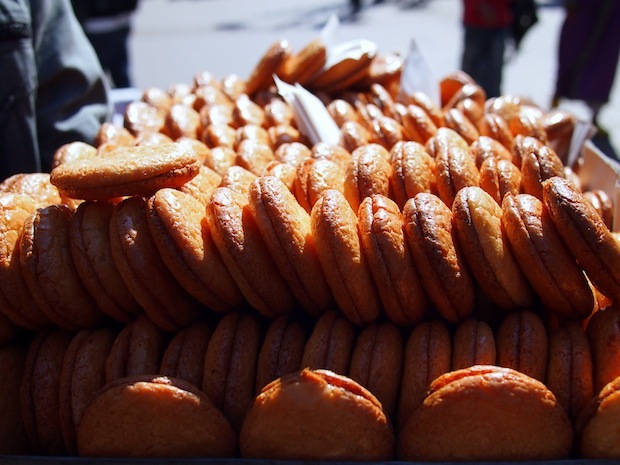 I believe these are called ghoriba, but there are several types – some have an almond in the middle and are coconutty and chewy, others made with rosewater with some cinnamon and lemon zest. Either way, they are fabulous! Here’s a recipe for the basic one: http://www.foodgeeks.com/recipes/moroccan-almond-macaroons-18907 Enjoy! 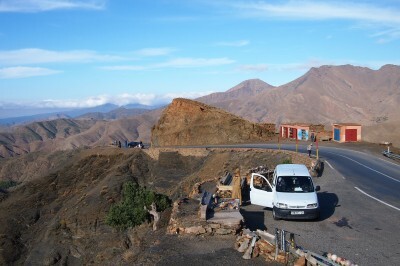 My husband and I just returned from a two-week hiking trip in Morocco, just outside Marrakech in the Atlas mountains. Unfortunately I was not a great fan of Marrakech. I found it noisy, crowded, smoggy, and I was groped in the main square in the middle of a large crowd. I would not go again. We also contracted the Shigella bacteria from pre-made sandwiches at the Marrakech airport. All-in-all, not such a great trip. Going tomorrow! Actually going there a bit blind as I’ve not done any research until now. Got a couple of weeks for a quick spin through the country. Great article as usual and I’ll surely come back for another look when I’m in country. Looks like a top place. Hi Jodi, I am due to go to Marrakech in a few days for a week with my elderly parents. Feeling a little anxious as this will be their first proper holiday and not sure what to expect with what is available for them to see without walking around too much. We plan to go to ouzoud falls but don’t know if they can manage the steps which will be a shame. Also heard the food is really pricey. 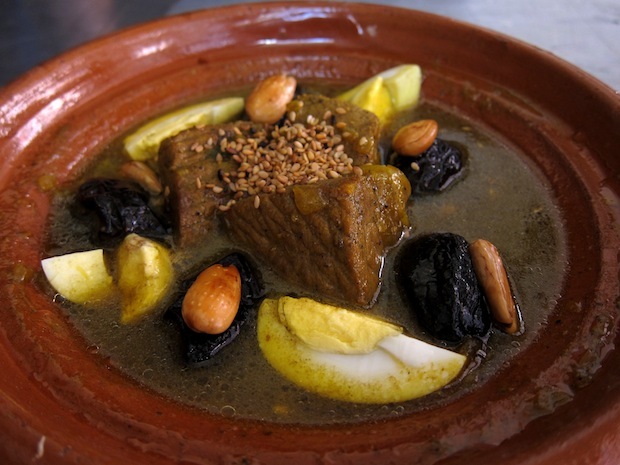 Any tips for affordable and also child friendly places to eat at near djemaa el fnaa? Hi Masuma, it’s been quite a few years that I was there so I can’t quite help you with these questions as prices are likely different now. 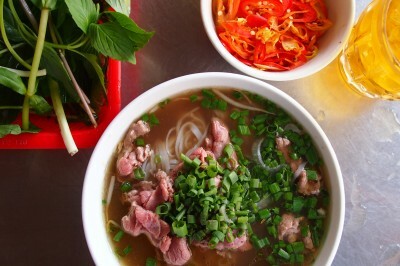 I ate at small snack places or in the centre of the Fna at the soup stalls, which were reasonable. Child-friendly – not sure what that entails as most people just brought their kids to all the chaotic stalls! :) Apologies I can’t be more help – perhaps look to Thorn Tree forums for more recent answers? Thank you for this info Jodi! 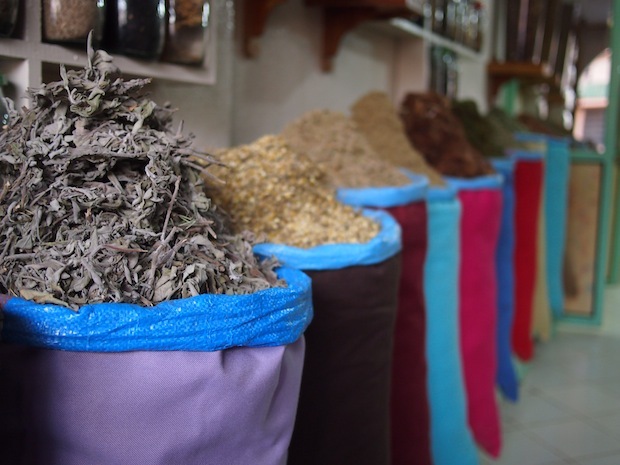 I will be using some of these and look forward to my trip to Morocco next week! Hopefully will get to check out Morocco later this year. Thanks for the guide! Thanks for this information, really helped plan my trip to Marrakesh. Ate at stall 32 a bunch of times and it was great!